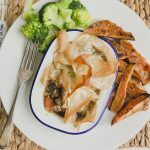 All these chilly February evenings have got me craving a comforting Steak Pie. 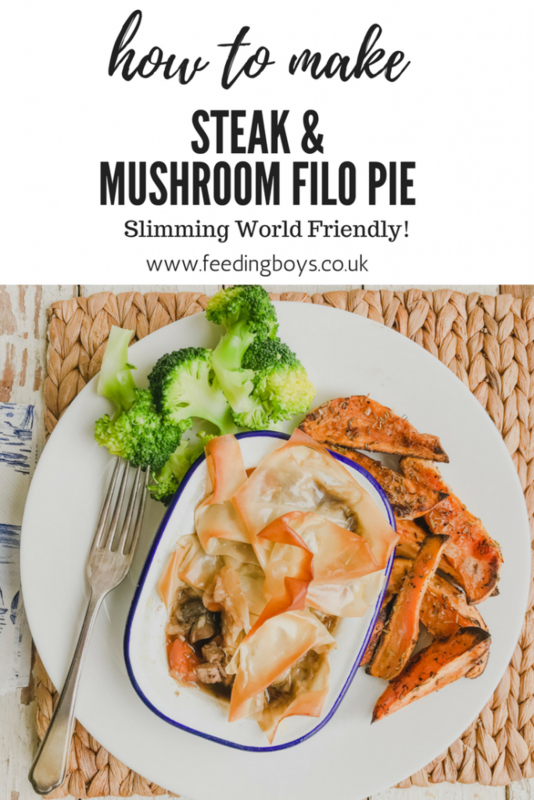 But all that pastry is hardly a slimmer’s friend, so I therefore tasked myself with coming up with a Slimming World friendly steak pie to get all cosy with. When I sat down and thought about it first of all, the filling itself is already really Slimming World Friendly, as it’s basically along the same lines as my easy Slow Cooker Beef Stew. I made a few simple tweaks to that recipe – namely taking out the oil, wine and flour and adjusting some of the flavours – and ended up with another wonderfully tasty but lighter beef stew. There’s just something so divine about meltingly tender chunks of beef in a robust gravy packed with vegetables. I chose button mushrooms and carrots as my speedy veg, but you could quite easily use other winter veg like butternut squash and leeks. The tasty beef stew would be just fine ladled over a crisped jacket potato or some steamed rice, but it was a crunchy pastry lid I had my heart set on. So how many Syns is in pastry? Well puff pastry clocks up 5 Syns per 25g, shortcrust 5.5, reduced fat pastry is 4.5 for the same amount, but Filo is just 3 for a 20g sheet. There’s something so satisfying about the crispy crunch you get from Filo, and I love how pretty it looks once it’s cooked. All different shades of golden. To serve up I roasted up some sweet potato wedges to mop up the rest of that delicious gravy, and a pile of steamed broccoli to up the speed content of my dinner. You need to be filling your plate with at least one third speed foods when you’re following Slimming World. There was a bit of leftover meat after I’d made four pies, so I had it with a jacket spud the next day. I still had quite a bit of gravy left too, so I added that into a batch of Butternut Squash Soup to deepen the flavours. Isn’t it the best when a meal just keeps on giving! Spray the bottom of your slow cooker with fry light and over a medium heat soften the onion with a pinch of salt for a few minutes, then add the crushed garlic for another minute. Season the braising steak with salt and pepper and then add to the slow cooker and brown off the meat, adding the dried rosemary too. Once the cooking time is done, pre-heat the oven to 200C/180C fan/gas 6. 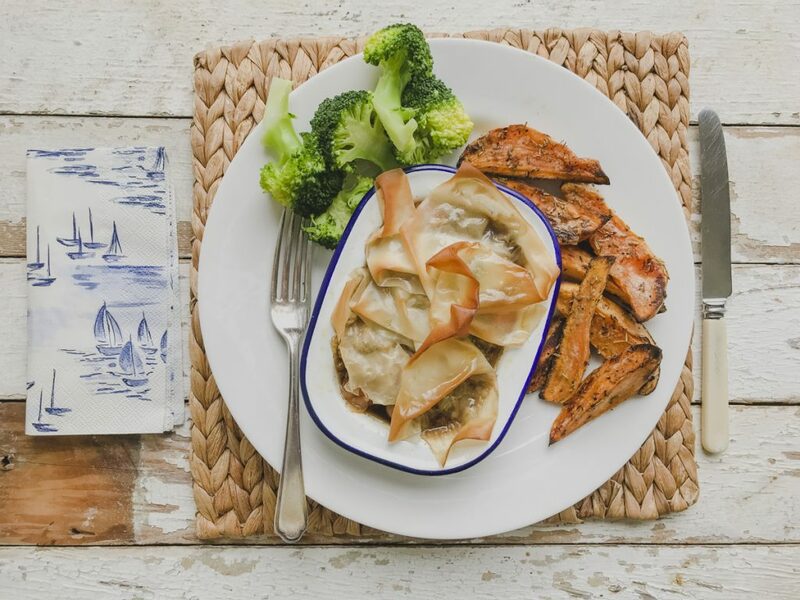 Get four mini pie dishes and fill with the chunkiest bits of the beef stew, plus enough juices to come about half way up the dish. Don't over fill with juices or it'll make the pastry too sappy. Cut each sheet of filo pastry in half, then scrunch up a bit and place on top of each pie dish. Spray liberally with fry light, and then pop on a baking tray into the oven to crisp up for about 10 minutes. Keep an eye on them as they can quickly burn! Serve with plenty of steamed greens and sweet potato wedges. At the time of writing this recipe, 1 x 39g sheet of Jus Rol Filo pastry is approximately 5.5 Syns, making each pie about 3 Syns per serving. Homemade pies are so comforting. 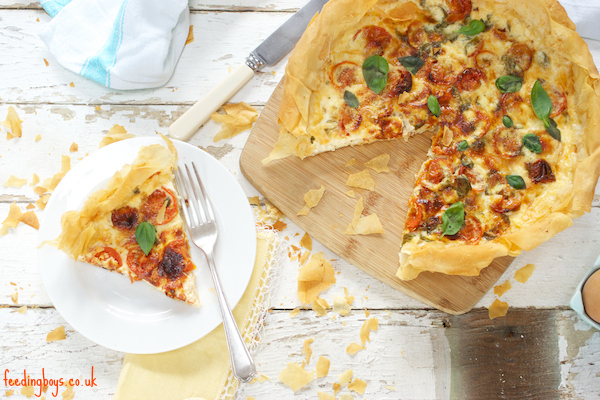 I love that you’ve used filo pastry to for a lighter crust. I love Filo Jemma, it’s so versatile! Mmm what a delicious yet healthy winter dish! Of course I am loving the use of the slow cooker to make this too, just great for the whole family. Oh yes, the slow cooker is a much-loved thing in this house!!! I’m so impressed with your commitment to eating healthier Katie and every day you inspire me. This looks delicious. This pie sounds perfect for this weather and great that it’s lower in calories for those of us still trying to loose our Christmas pounds!